We left Mackinaw City under cloudy skies. Rain was predicted, but not much wind so we expected calm seas on our first day on Lake Michigan - finally heading south! The rain didn't really show up - but neither did the calm seas. As the day went on conditions got worse. We had planned a long day, but cut it short and stopped at Charlevoix. When we did the loop Charlevoix was a popular stop that we missed so it didn't take much to sway us. When Joe went in to pay for our dockage he learned that our second day would be free. We'd never pass up a deal like that - and the weather didn't look promising anyway. Now we know why everyone likes Charlevoix! Nice little town but the big attraction for us was the Earl Young designed homes, referred to as mushroom, gnome, fairy or hobbit houses. Earl Young dropped out of architecture school after one year and proceeded to become a self-taught architect. He agreed with Frank Lloyd Wright's philosophy of fitting the house into the landscape. He also seems to have had a great love of boulders. He supposedly would collect boulders he liked and hide them - underground, in the woods, in Lake Michigan - until he found the proper use for each individual one. The exteriors of the houses are so interesting, often with stunning landscaping, but we would have loved to be able to go inside. We heard that they are not always easy to live in as functionality was not Mr. Young's primary concern. And he was only five feet tall. After spending two days in Charlevoix, we left at dawn to cruise almost 80 miles south to Frankfort. Again we didn't have the calmest seas and they were building as we pulled into our slip. We arrived early enough for me to get in a good walk through town. 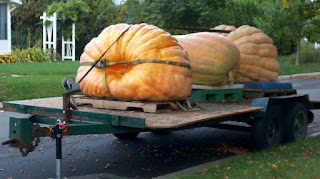 I happened across a trailer full of the biggest pumpkins I've ever seen. 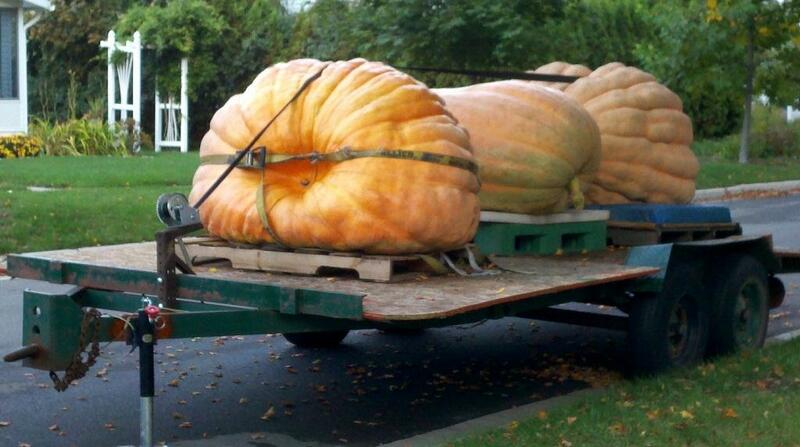 Since our daughter, Caitlin, had lost all her baby pumpkins to squash borers, I had to get a picture. The next morning we left early again as there was a good weather window to cross the lake to Wisconsin where we would find more shelter from the winds. After some debate we decided to go to Manitowoc. That decision was driven by the predicted weather for the next few days. Manitowoc is big enough to find things to do when you can't move the boat. Enterprise also had started their annual week-end specials - $9.99/day on weekends. We decided to take advantage of that so we could see more of Wisconsin. The bad weather showed up on schedule the day after we arrived. Gale force winds - up to 55 knts - and BIG waves - 25 feet with occasional 35 foot ones. We know that because of checking the buoy and weather reports - not from actually experiencing them. Tucked safely in our slip the waves weren't more than about six inches, although Carolyn Ann did dance around a bit on her lines. During the night the wind howled but by midday Friday Joe felt comfortable enough to leave the boat and start up to Door County. On our way up we heard on the radio that because of downed trees and power failures all the state parks would be closed until Monday. A little disappointed, we continued. Our first challenge was finding a place to spend the night - so much power was off and people flock to Door County for the fall foliage. We found a small motel on the less popular lake side and then started the search for dinner. Not only were the tourists dining out, the residents without power were eating out too. We finally found a little bar/grill - the Blue Ox - and had a good dinner. Chatting with folks at a nearby table we learned about a trolley of Door County's famous... cheese factorys?... cherry orchards?...apple orchards? No, vineyards, of course. This was our chance to fill the gap left when we missed the Finger Lakes vineyards. On our tour Daryl, our driver, filled us in on lots of Door trivia - and the best restaurants, cheese shops, produce markets. We visited four vineyards, tasted lots of marginal wines, had a nice lunch and lots of fun. One interesting bit of trivia was that Al Capone tried to buy one of the farms that is now a vineyard. Offers were made three times and the farmer declined all three times. When the current owner decided to make it a vineyard, the grandchildren of the farmer told him the story. Thus, the first red wine they produced is called "Untouchable." Joe would also call it "undrinkable," but that's another story. One of the restaurants Daryl recommended was an Italian place on the northern end of Door County. Turns out it was attached to an inn that had a vacancy, so we made a reservation. When we arrived later the "no vacancy" sign was lit, so we'd been lucky to get the room. Also lucky because the restaurant prices were reasonable and the food was great - Pasta Vino if you're ever near Ellison Bay. Another reason we wanted to go to that area was to see this road we'd seen on a postcard. The next morning we had to stop in Egg Harbor for breakfast. I say "had to" because Al Johnson's Swedish Restaurant is in my book of 1,000 places - not actually because of the food, though. The big attraction is the goats grazing on the sod roof! Wisconsin does have a large Swedish population, so we sampled the Swedish pancakes, meatballs and lingonberries. I wasn't excited about the meatballs, or really the pancakes either, but the lingonberry jam was great. They're related to cranberries and make a nice tartish jam. When we had decided to rent a car, we started looking for places to go. I stumbled upon a Frank Lloyd Wright house in Two Rivers, just north of Manitowoc where we were docked. My excitement dimmed as a saw they only did one tour every other month. However, it turned out that we had hit the right timing and could stop for the tour on our way back from Door County. In 1938 Frank Lloyd Wright had gained famed for his architecture when Life Magazine asked him to design a house for an article they were doing. Life's plan was to have a traditional and modern house each designed for families in four different income levels. Wright's design was for a family in the $5,000 to $6,000 income range. The family picked Wright's designed, but were unable to obtain financing for such an unconventional house. They ended up building the traditional design, and Wright was happy when Bernard Schwartz contacted him about building the Life house on the river in Two Rivers. This house is one of what Wright referred to as Usonian (which he preferred over American). These were usually small, taking advantage of passive solar heating, natural light through clerestory windows, natural cooling and radiant floor heating. Instead of the expensive leaded glass windows seen in many of his homes, these had wood inserts to add interest to the windows. Typically for a Wright home, there was little need for additional decoration as he designed it into the house and included built in furnishings. The current owners are working to bring the house back to its orginal design and even trying to find the plans for some of the furniture that was designed and not built. As with most (all?) of his designs, this went way over budget. The house is available to rent for special events - and even to spend the night in. That would be quite an experience. The weekend of calm weather had allowed Lake Michigan to settle down, so it was time get underway again. We spent a long day on the water before anchoring for the night in Milwaukee, then a short day to reach Racine. In 2009 we had a nice stop in Racine where the O'Donnell's had let us use their slip. Joe called to see if they were in town and if we could get together. We knew they had sold their GH37 (the one that Gary, the guy in St. Clair, had originally owned) and thought they'd also sold the slip. Unfortunately, they were not in town, but fortunately for us they have not sold the slip. We stopped there for a couple of days because we had mail coming in. Thanks, guys! We left Racine as the sun peaked over the horizon for our last day on Lake Michigan. The weather cooperated again so we by-passed Chicago and kept heading south. We put in a long day and must've really made some progress because we warmed up to 80 degrees! As we traveled down the Cal-Sag Channel, we again saw the nice parks with waterfalls that we'd noticed on our first trip through here. From our new guide, which had mailed to Racine, we learned that these are SEPA (Sidestream Elevated Pool Aeration) stations. Besides being attractive, they circulate what would be stagnant water and also add oxygen for the fish. So, in a month we had traveled from the Erie Canal, across Lake Erie, up Lake Huron, down Lake Michigan and entered the inland river system. We were really feeling pretty good - as Joe said, "It's all downhill from here." Our first full day off the lakes was expected to be a short one - 36 miles. We started out near dawn heading for Joliet, with only one lock in our way. We arrived at the Lockport Lock around 11am and were told to tie up to a wall nearby. Unfortunately, while they were constructing a new wall, a portion of the old wall collapsed. The lock was closed while they evaluated the damage. It could have been much worse. The wall is actually a levee protecting the town 45 feet below. When the wall collapsed, enough structure was left to contain the water. After more than six hours of waiting, we were allowed to lock down and tied to the wall in Joliet shortly after sunset. While it certainly was not a huge problem for us, we hope this is the most exciting thing to happen on the remainder of our trip!